Look for my contributions to Bowling This Month in my Slowinski at-large column. Here are some of my published bowling articles in BTM, Bowlers Journal and the Asian Bowling Digest. In the February 2012 Slowinski at-large, I discuss the evaluation of three critical areas to help get the most out of your team. These include skill set assessments for knowing what a player can be expected to do in competition, evaluation of shared team goals and determining team social support. In the January 2012 Slowinski at-large, I discuss the arsenal sequence process. Specifically, how do you choose bowling balls (layouts & surfaces) to set-up for fresh, transition and burn? In addition, how will the environment impact ball motion as well as choosing the appropriate sequence of bowling balls? 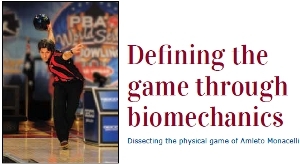 In the December 2011 issue of Slowinski at-large, I introduce readers to biomechanical terminology and how this can be utilized to more accurately describe the physical game. In an effort to help readers understand the concept, I share a biomechanical analysis of Amleto Monacelli's game. In this article, I discuss the important of ball speed in ball reaction. In addition, I provide readers with a research-based method to reduce ball speed. In the December 2009 Slowinski at-large, I discuss seven steps to developing a high quality high school or collegiate program. In the November 2009 Slowinski at-large, I share with readers a research project on the most effective targeting methods for cross-dominant bowlers. Specifically, cross-dominant bowlers are those who throw with the arm with is the opposite side of the dominant eye. The findings of the research reveal that specific targeting methods can help cross-dominant bowlers improve target accuracy as well as improve ball speed consistency. In the October 2009 Slowinski at-large, I illustrate three different lane conditions in both 2-d and 3-d images. 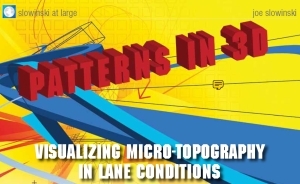 Specifically, in the article, I discuss the importance of reviewing 2-D graphs and interpret these into 3-D as well as how to improve your visualization of micro-topography in lane conditions. 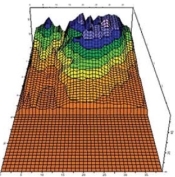 Since most individuals have not had the opportunity to see graphs in 3-D, in this month’s Slowinski atlarge, I present several patterns in three dimensions. No special glasses are needed. It is an opportunity to truly see the contour, shape and topography of the pattern. To illustrate, I share with readers detailed two and three dimensional views of the 2009 “The BTM” Tournament (39 feet), the 2009 USBC Open pattern (40 feet) and a typical house shot (40 feet). Although the pattern lengths are similar, each pattern is very different, from a structural standpoint. Specifically, I want readers to see the differences between a 1-to-1 flat pattern and a typical house condition as well as an easier sport pattern. In the September 2009 issue of Bowling This Month, I provide readers with a diagnostic check-up list to evaluate their physical game. From the stance, footwork, swing, finish and timing, this check-up will allow you to evaluate the current status of your game and determine how consistent you are with top players. This month I want to discuss a secret weapon. This secret weapon is critical to performing at your optimal best, yet few people take it seriously. Rather, this area is neglected, ignored or unrecognized as important. This secret weapon is how long you sleep. Research has revealed that extra prolonged sleep can improve athletic performance in a significant manner, while sleep deprivation is detrimental to performance. In the July Slowinski at-large, I share with readers an extremely effective visualization process: PETTLEP. PETTLEP involves specific methods of visualization that have been shown to be significantly more effective than traditional visualization methods espoused in sport science. 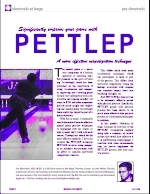 In conclusion, I make specific recommendations on implementing PETTLEP into your bowling training process. If you want to take your game to the highest level, you need to read this article. In the June 2009 Slowinski at-large, I discuss the importance of the balance arm as a dynamic system in the physical game. From creating torso rotation to improving the energy transfer from the hand to the ball, this is a must read for anyone who wants to elevate their physical game to an elite level. It is also an important read for coaches to prepare their players for the modern game. 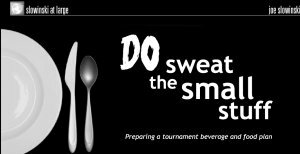 In the May 2009 Slowinski at-large, I discuss several important elements of preparing for tournaments. The May issue focuses on helping elite youth bowlers prepare for success at Junior Gold, where Junior Team USA is chosen. Yet, the items discussed in this article can help any bowler be better prepared for tournament play. In the April 2009 Slowinski at-large, I discuss 6 steps to dealing with the fresh as well as transitions more efficiently. Specifically, I discuss lining-up on the fresh, dealing with transition, conducting a bump test, arsenal sequencing as well as surface change. 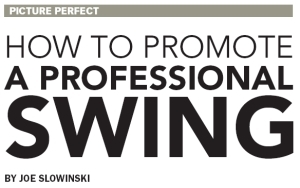 In this Bowlers Journal Picture Perfect article, in March 2009, I discuss the important elements of promoting a professional swing from the stance through the engagement of the swing. This is an important read for coaches and bowlers. In my January 2009 Bowling This Month article, I introduce readers to the negative impact of stress and anxiety on performance. These realities are often over-looked when attempting to improve one's game. But, the truth of this evidence reveals that bowlers will not improve unless they make a proactive effort to improve their mental game, especially in recognition of stress and reducing anxiety. In closing, I discuss some easy-to-use techniques to reduce stress. This is an important article for those who are bowling at a high level and want to improve. In the December Slowinski at-large column, I share with readers a new drill that I developed to help bowlers improve their swing as well as torso rotation. The Swing and Slide drill is a one-step drill to help you establish an improved slide to flinish. With consistent use of the drill, you game will improve. This is also a great drill for coaches to introduce with their students. 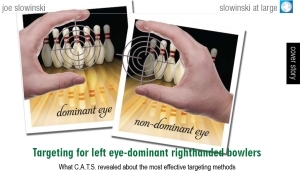 In the November 2008 Slowinski at-large column, I share with readers how effective the 3-Point Targeting with Quiet Eye system is when bowlers implement it correctly. Through the use of before and after C.A.T.S. data, the system has proven to increase a bowler's accuracy in a remarkable and immediate way. In addition, I provide readers with a detailed discussion of the current iteration of the system. This will help you master the use of the 3-Point Targeting with Quiet Eye system. In the October Slowinski at-large, I share with readers an extremely detailed picture of how lanes transition on the 2007 Junior Gold medium pattern, 40 feet. The data was collected at the Kegel Training Center Tapes were taken in 8 places per lane (5, 10, 15, 22, 25, 30, 38 and 44 feet) on the fresh, after 15 minutes of practice, after game 1, after game 2 and after game 3. With this knowledge, bowlers can better anticipate lane transitions and take advantage of optimizing scoring. I demonstrate that carry down is a myth. Rather, oil depletion is why ball motion changes in the modern sport of bowling. In my September Slowinski at-large, I discuss the importance of developing a food and beverage plan for improving tournament consistency. I discuss the critical importance of remaining hydrated as well as managing glucose in-take. Both can greatly affect accuracy. In addition, I provide readers with a how-to develop a food and beverage plan. Did you realize that Jason Couch and Chris Barnes share nearly identical biomechanical movements. It is true. This is why they both have been so successful at the top level of our sport. In the July 2008 Slowinski at-large, I share with readers the keys to creating the best swing. Specifically, I explore the components of creating a swing slot. A great swing is the direct result of a number of specific and critical biomechanical movements. 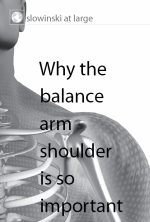 The top professionals do specific things that lead to the most efficient biomechanical movements. Learn how to do these in your game. In my June 2008 Slowinski at-large, I share some secrets of throwing the ball straighter to improve spare shooting accuracy. This is a must read for those who want to get getter with their spare shooting game. In my May 2008 Bowling This Month column, I discuss some important considerations for coaching elite youth, high school and college bowlers. These include differences between adults and teenages in the actual wiring of their brain and how this can impact coaching a bowler. In addition, I discuss the unique sleep needs of youth bowlers as well as how to improve the self-efficacy of youth bowlers. This is a very important piece for coaches to read. In my April 2008 column in Bowling This Month, I discuss an easy-to-use method to increase your rev rate. To generate a higher rev rate, your hand must be in a strong position entering into the release. In the April Slowinski at-large, I show you how to achieve this strong position allowing you to bump-up your rev rate when you need to increase it. In the March 2008 installment of my Slowinski at-large column, I share with readers how important quiet eye targeting techniques are to elite performance in sport. The article begins with an overview of the research on quiet eye techniques' contribution to improving accuracy and consistency. I conclude the article with a 3-step process to improve targeting and accuracy. This includes recommendations on how long to target and where to target. I strongly recommend that readers use both the 3-Point Targeting system and Quiet Eye targeting process together. You will find that these compliment each other well and will contribute to a significant improvement in your performance on the lanes. In my February 2008 Bowling This Month, Slowinski at-large column, How Important Is the Mental Game? Are You 100% Committed When Competing?, I share with readers two case studies illustrating the importance of the mental game in improving performance. In the first case study, I analyze the mental game of Todd Book, winner of the 2007 Tour Trials. In the second, I share the story of an elite youth bowler in Malaysia who transformed his performance at an important international event with an increased dedication to the mental game. Finally, I share with readers my 7-step pre-shot routine which has been used successfully in maximizing scoring consistency and reducing emotional inconsistencies. After reading this articles and learning about these cases, I think you will agree that the mental game is a key to success at the highest levels of our sport. In the January 2008 installment of Slowinski at-large, I share with readers information on developing more detailed training using a periodization plan. In short, periodization will help you determine how-to peak for major tournaments. You begin by prioritizing all of competitions throughout the year, by importance, from not very to the most important. As you build your New Year's Resolution, use periodization to determine your important competitions and corresponding training volume,frequency and intensity to peak for the most important events. Use this article to help you develop a plan for pre-season, season and post-season training. The article also includes a general training guidance for practice during the main season. In the December installment of Slowinski at-large, I introduce the idea of an international bowling skill score number as a method to evaluate a bowler's overall skill level (versatility, acciuracy, power, repeatability & knowledge). I believe an International Bowling Skill Score Number system will allow us to compare any two bowlers worldwide. With the use of C.A.T.S. or DigiTrax with Bowlers Map, coaches can assess players allowing a more thorough identification of strengths and weaknesses. For my October/November 2007 article in my Asian Bowling Digest column, State of Our Sport, I provide readers with a recommended practice process to help them become world-class holistic bowlers. The articles includes recommended domains of training, a 90 minute general training process (warm-up, release variation, spare-shooting, mental game, cool down) as well as discussions on comparing your ball reaction within your arsenal, fitness and goal-setting. Experimental Tips to Improve Your Skills. Bowling This Month, November 2007, 10 - 12. In the November Slowinski at-large, I offer readers 4 experimental tips that will expand their skill sets. How does putting your thumb in the ball first impact ball motion? What is the intersection spare system? How can you adjust axis rotation with finger tip pressure at release? Can you throw straighter with just two fingers? The answers and a discussion available in the article. Click here to download the file (243 KB). In the September 2007 installment of Slowinski at-large column, appearing in Bowling This Month, I share with readers a summary of research on ball reaction from Columbia 300, Ebonite International and USBC. 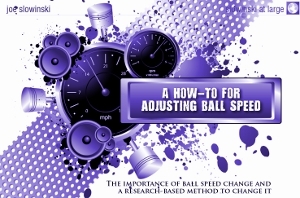 The article discusses how much we know, specifically how much ball reaction change a skilled bowler can create by manipulating axis rotation, ball speed, rev rate change, cover surface change, etc. This is a must read article for the serious bowler or coach. In this issue of my Slowinski at-large column, I discuss the structure of an elite training program for teams or individuals. These are the minimum components needed for a holistic program. In the July Slowinski at-large column, I share an analysis of the 2-haned thumbless delivery as well as some guidance on how to bowl with this or coach it. Welcome to the future! 3-Point Targeting for Advanced Lane Play, Bowling This Month, June 2007 (Pg. 36 - 41). Slowinski at-large shares with readers an advanced targeting system to greatly increase accuracy and consistency. The system aids a bowler in appropriate launch angle, choosing where the ball should exit the oil pattern and choosing a visual target to alter ball reaction. This is the actual article published in the May issue. A comparison of youth and coach development models. In essence, Malaysia is extremely structured with much centralized funding. The article discusses both models of development. This is also an actual copy of what was published in the May issue. A Pushaway Drill to Improve Your Swing and Timing: Four Phases You Can Do Easily and Anywhere, Bowling This Month, April 2007, 35 - 38 (1.25 MB). A more extensive version of my pushaway drill incluing more illustrations and description. This is the 8 Tips to Improved Spare Shooting in publication form. This article focuses on 9 tips to improve your spare shooting. Article reflects on research condicted by USOC sport psychologists. Specifically, the articles shares what elite bowlers can learn about the psychological attributes of 10 of the greatest USA Olympians of all time. These 10 athletes won 28 gold medals and 32 overall between 1976 and 1998. I present a review of Ebonite's new software tool, DigiTrax, for the Asian Bowling Digest. DigiTrax is a software package that uses 30 frames a second of digital video to calculate a bowler’s ball path with a complex analysis of 16 individual data points including: laydown board, loft distance, launch angle, launch boards covered, board at the arrows, launch speed, launch boards covered, midlane speed, entry speed, breakpoint board, entry board, backend boards covered, total boards covered, hook power and more. In this article, I discuss 8 tips to help you improve your spare shooting. If you follow these steps, you will become an improved and more consistent spare shooter. Remember, the old adage still applies on challenging conditions (i.e., strike for show - spare for dough). This article will appear in an upcoming 2007 issue of Bowling This Month. It describes an advanced targeting system that I have created called the 3-Point Targeting System. Based on research of where the ball should exit the lane condition, based on pattern length, the system also uses the ideas of focal point paired with visual target length to provide increased accuracy and repeatability playing any lane condition. In this month's issue of Slowinski At-Large, I share with readers a 5-step drill that I teach bowlers. Specifically, the 5-step drill aids bowlers in improving timing and achieving a swing that is more free. It is also a great warm-up drill prior to bowling. In this month’s issue, I explore the concept of a Mental Focus Intelligence Quotient (F.I.Q.) for bowlers. As an elite bowler, your F.I.Q. is a critical element to your mental strength because it illustrates at what level of commitment to excellence you are dedicated to in the sport of tenpin bowling. For those with a high F.I.Q., they take each shot with the same dedication and energy, a high mental focus. They are focused with great attention to detail on all of the bowling tasks at hand. These type of bowlers, focus on every aspect of the game and with an equally high level of energy. On the other hand, those low on F.I.Q., are bowlers who will not reach their full potential since they are inconsistent with focus, mental energy and commitment on the lanes. Are you one of these? Do you suffer with a lack of bowling focus? From my perspective, this is like an illness inflicting many bowlers game with a lackadaisical approach. Or, rather, are you mentally strong with a world-class approach to mental focus. What is your F.I.Q.? An article based on my reference bowling system. This introduces readers to a method to change the axis of rotation with relative ease allowing better consistency through improved repeatability. Please note, when you read the article, that the 1 o'clock and 12 o'clock reference points have to do with a point in the follow-through NOT INSIDE THE BOWLING BALL AT THE RELEASE POINT. I suggest that you read the article several times. 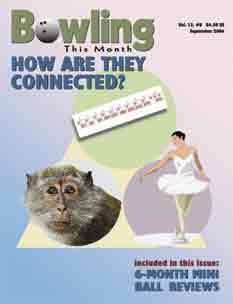 This above article provides readers with an advanced training program based on current research in how humans learn. Specifically, this new brain research suggests some very powerful truths about the relationship of viewing in human minds and complex movement of our bodies. In this article, I will discuss these findings as well as make some recommendations on a new but effective training process based on this new information. I call this process the Visualization Training Cycle for Bowlers (VTCB). I believe strongly that this process will help improve your game as well as those you coach. The above article discusses the five ball reaction manipulations that elite bowlers must master. This is Part 1 of a series of six articles. Part 1 discusses axis of rotation, axis tilt, speed, revolutions and loft. The above article discusses research findings on pre-shot routines and offers readers a pre-shot routine that will help improve their performance. Article discusses using statistical data to measure performance and compare bowlers. This article earned a Third Place prize in Ebonite's International Bowling Writers Contest. I discuss the state of bowling coaching.